Hop on over for a holiday egg hunt with us! A DJ will kick things off at 11 am, the hunt begins at 12 pm SHARP! We will also be collecting non-perishable food items to support the South Elgin Food Pantry! All ages welcome! Registration not required. Our Egg Hunt is FREE, but please consider donating non-perishable food items in support of the South Elgin Food Pantry. 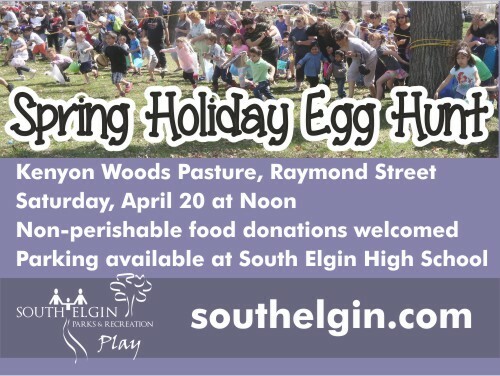 The egg hunt will be held at Kenyon Woods Pasture on Raymond St., in South Elgin. Parking will be available at South Elgin High School.